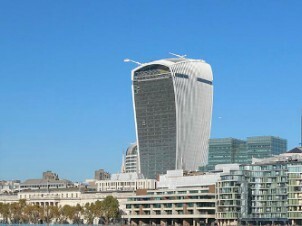 The ‘Walkie Talkie’ building London – 20 Fenchurch St.
Supply, deliver, offload, position and install 4 water storage tanks, levelling steels, connections, ladders and guardrail. The ‘Walkie Talkie’ building is officially known as 20 Fenchurch Street (derived from its permanent address), with the former label owing to its distinctive appearance. The skyscraper was designed by architect Rafael Viñoly with a typically unconventional top-heavy design. Construction began in 2009, and the project was completed in April 2014. The building presented a number of unique challenges because of its distinctive construction. Comprising of 34 storeys and with a height of 160m, it is one of London’s highest buildings, behind the Shard, for which Dewey Waters has also supplied water storage tanks. The building provides over 680,000 sq ft of office space, and since January 2015 have incorporated a sky garden with bar, restaurant and terrace. Dewey are proud to have been a part of the development of such a recognisable building.